In Rule Makers, Rule Breakers celebrated cultural psychologist Michele Gelfand takes us on an epic journey through human cultures, offering a startling new view of the world and ourselves. With a mix of brilliantly conceived studies and surprising on-the-ground discoveries, she shows that much of the diversity in the way we think and act derives from a key difference—how tightly or loosely we adhere to social norms. In search of a common answer, Gelfand has spent two decades conducting research in more than fifty countries. Across all age groups, family variations, social classes, businesses, states and nationalities, she’s identified a primal pattern that can trigger cooperation or conflict. Her fascinating conclusion: behavior is highly influenced by the perception of threat. With an approach that is consistently riveting, Rule Makers, Rule Breakers thrusts many of the puzzling attitudes and actions we observe into sudden and surprising clarity. Michele Gelfand is a Distinguished University Professor of Psychology at the University of Maryland, College Park. Her pioneering research into cultural norms has been cited thousands of times in the press, including in The New York Times, The Washington Post, Harvard Business Review, and Science, and on NPR. The recipient of numerous awards, she is a past president of the International Association for Conflict Management. “Offers a powerful new way of seeing the world. Gelfand's deceptively simple thesis becomes increasingly compelling as her research unfolds across politics, class, and organizational behavior. Best of all, she provides a new toolkit for change." "Remarkable. Not just an enlightening book but a game-changing one. 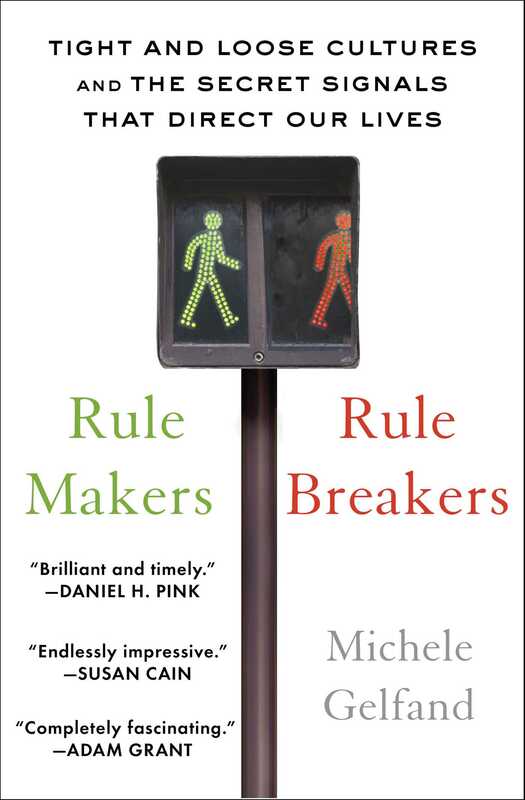 By uncovering the inner workings of tight and loose cultures, Rule Makers, Rule Breakers suddenly makes sense of the puzzling behavior we see all around us—in colleagues, family, and even ourselves." “Gelfand has done much to unravel the mysteries of human motivation." "Fantastic . . . Its beauty derives from the breadth of its insight as Gelfand focuses in to illuminate, in succession, countries, states, corporations, groups and individuals."